A considerably argued dissension around the China Pakistan Economic Corridor (CPEC) appears greatly provocative to Balochistan and Khyber Pakhtunkhwa. Because, the bizarre attitude of the federal government obliged people upped the ante for multi-billion dollar projects. Thus, the political parties in KP and Balochistan have raised the issue that the central government is ignoring the smaller provinces of its actual share in the CPEC project. But, the ruling parties of Balochistan particularly Pashtunkhwa Milli Awami Party (PkMAP) has frequently ignored the utmost imperative concern in its tangible nature. However, the strategic jewel like Gwadar has been handed over to Chinese government without taking into consideration the main stake holder Balochistan. Therefore, there seems –innumerable anxieties regarding – the CPEC that Punjab is taking a lion’s share in the multi-billion dollar project. 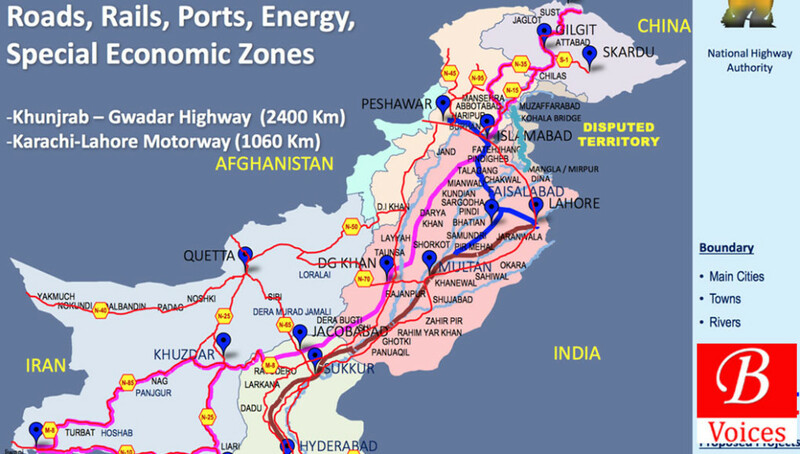 For instance, the central government has prioritized the eastern route over the actual and underprivileged western route via Balochistan and KP. People of Balochistan hence – contemplated the CPEC – as a Punjab-controlled, Punjab-negotiated and Punjab-centric development project, that bids very small long-term, development to the already ostracized provinces. Gwadar port often been explicitly came under the influence of federal opportunist government. Therefore, contritely, Balochistan and KP have been completely bypassed by the discriminatory Islamabad sedentary central government in the multi-billion project. Similarly, “The visionless provincial regime in Balochistan is intentionally ignoring the long-term interests of its people. Regrettably, in the CPEC project Balochistan is the major contributor in terms of land, port, extractives and connectivity. Balochistan will also bear the brunt of the potential environmental damage due to the inevitable disrespect on the part of the project handlers for the environment and marine life. We saw this in the Saindak copper-gold project where the foreign company working there was allowed excessive mining.” So that’s why – it made us to think that the akin injustices have been done by the federal political elites to implicitly convince the so-called ruling leadership of Balochistan to bypass the western route. Perhaps most significantly, the people of Balochistan are nervous about the recent project’s security, economic and strategic dispositions. Because identical projects have in the past augmented the repression and segregation of the Baloch rather than providing socio-economic opportunities and amalgamation. For example, the Sui Gas project, Ormara Naval base, Saindak, the Hub industrial project etc. Nevertheless, traditionally KP and Balochistan have contributed immeasurably – due to their geostrategic and geopolitical location in the region. But they get almost very less in terms of economic aids, development projects and full integration in the political domain. Despite, incalculable – contribution of the two marginalized provinces, the billons of US foreign aids and other billions of dollars have just been used for the socio-economic and military development of central-Punjab. The two isolated provinces have just bore the brunt of a massive influx of war-turn Afghan refugees and extreme Talibanization and radical movements. According to data from the Planning Commission, Punjab will get a lion’s share in the economic and strategic arena of the CPEC project. Ostensibly, this project would completely alter the “Punjab’s economic landscape, stimulate industrial growth, generate huge employment, and increase provincial revenue generation and long-term sustainable development.”Unfortunately, Balochistan, where $920 million will be spent on the upgradation of Gwadar port and the international airport. Which are under the direct control of the federal government? So therefore, it will not provide industrialization, socio-economic development and employment opportunities for the youth of Balochistan. Notwithstanding, All ‘early-harvest projects’ have been planned in Punjab and Sindh. Out of $28.6 billion early-harvest projects, Punjab has the lion’s share of $13 billion, Sindh $4.6 billion, KP $1.8 billion, Islamabad $1.5 billion, Gilgit-Baltistan $920 million and Balochistan $920 million. “Not a single early-harvest project is proposed or planned for Balochistan such as power-generation projects, hydel projects or small scale industrial zones along CPEC route which 50 percent passes through blood-socked Balochistan.” (Quondam Senator Sanaullah Baloch commented). Moreover, this project will not bring merriment to Balochistan rather than oppression, and isolation and will feasibly escalate the incompatible views among the people. However, China Pakistan Economic Corridor will not diminish the apprehension of local destitute folks of Balochistan. Rather, it heightens more tension and hatred in the days to come. Because, the local people are in a fix, that the CPEC would not provide an adequate socio-economic development and employment opportunities to their youth. Meanwhile, people will be left marginalized as in the past. Their anxieties would be augmented. Their land and environment would be damaged. And the privileges would be enjoyed by the big guns.